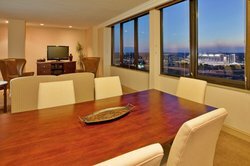 Stay just steps from the Chiefs and Royals Stadiums when lodging in Kansas City, Missouri at Adam’s Mark. Our accommodations offer the perfect blend of contemporary design and comfortable amenities included within your room. As half of our hotel overlooks the stadium, sit back for a showcase of Friday night fireworks at the end of the game! 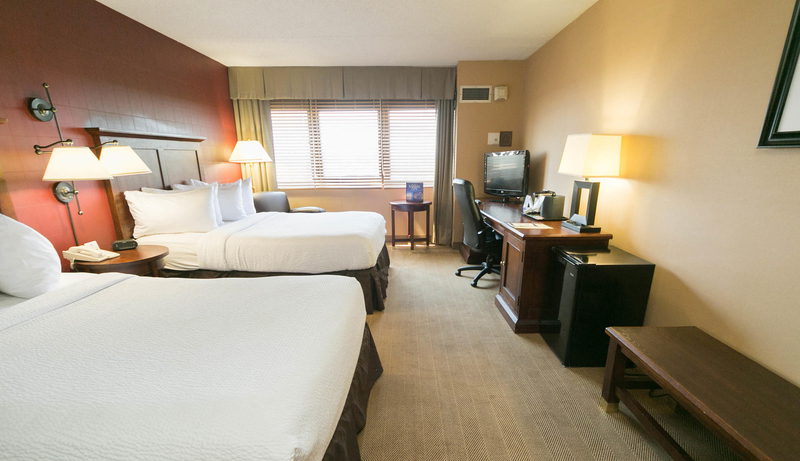 Our charming hotel rooms in Kansas City, MO feature little touches to elevate your stay, like leather sitting chairs, premium linen bedding, and free high-speed Wi-Fi. We’re a pet-friendly hotel with lots of outdoor space so bring along your furry friend. Another convenient option is to upgrade your room with hearing-accessible features, available as an ADA packet at our front desk. 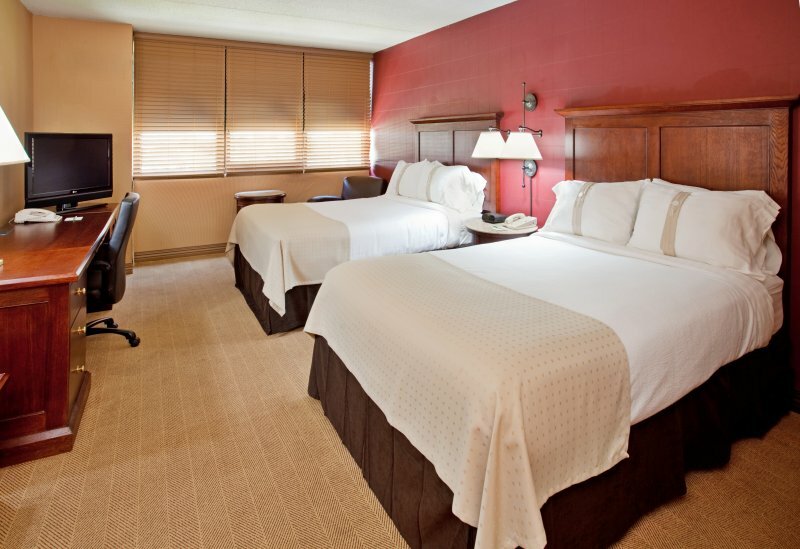 Enjoy ample workspace and plenty of room to relax while lodging in Kansas City, Missouri with us! Contact our Reservation Team using our Room Inquiry Form! 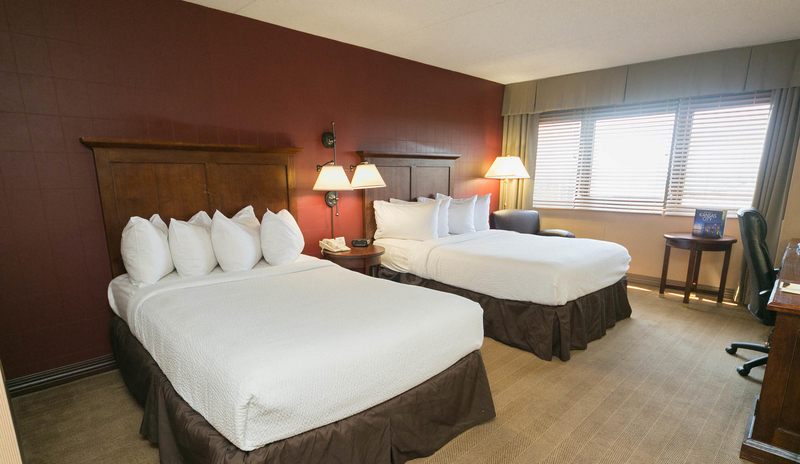 With two welcoming double beds, ample workspace, and a cozy seating area, this lodging in Kansas City, Missouri has all the amenities for a family getaway or work retreat. Our contemporary rooms are the perfect place to kick back and relax after a game at the Arrowhead or Kauffman Stadiums across the street. Have a productive stay when you choose our Standard King room, featuring contemporary touches and convenient in-room amenities. 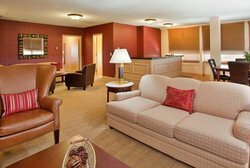 Included in your room is complimentary high-speed Wi-Fi, a 32” flat-screen TV, and a spacious work desk. 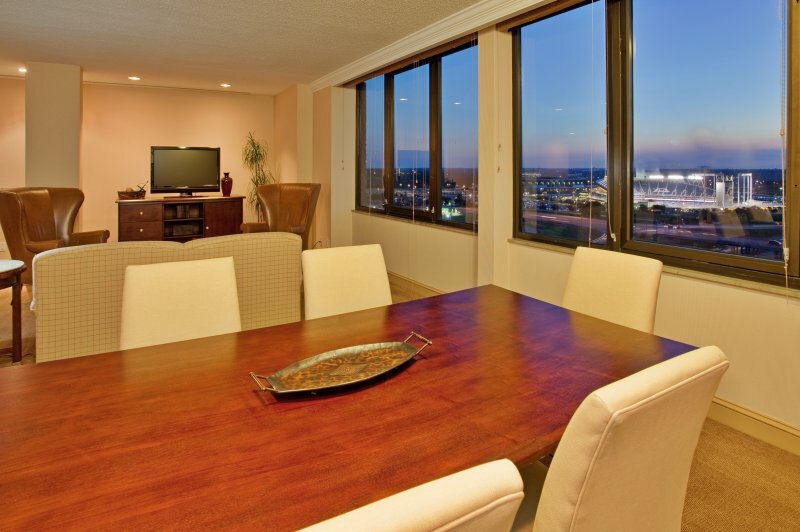 Our hotel places business travelers in the center of Kansas City! Perfect for a traveling group, rest easy in our cozy and affordable rooms with two double beds. 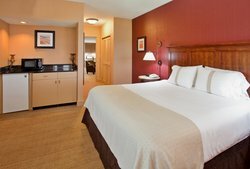 Each of our comfortable lodgings comes with modern amenities, such as free high-speed Wi-Fi, a 32” flat-screen TV, and a dedicated workstation. Relax in our King guest room, ideal for business travelers looking for streamlined accommodations. With a dedicated work-space, it’s easy to work outside the office with our free high-speed Wi-Fi. Sleep soundly with premium linens and easily get ready in the morning with a cup of coffee and fresh shirt off the ironing board. Our accessible hotel rooms in Kansas City have been designed with ease of access in mind. The room features a lowered queen bed, adjusted counter height, lower closet height, visual doorbells, and grab bars for easy bath access. 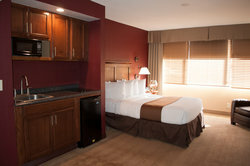 Included in the room are our standard amenities like free Wi-Fi, premium bedding, and a 32” flat-screen TV. Find the accessible features you’re looking for at our hotel by Kansas City’s largest sports stadiums! This accessible room features a lowered queen bed, adjusted counter height, visual doorbell, and a larger roll-in shower in the washroom. 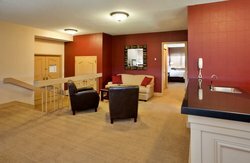 Stay a little longer in Kansas City in our extended stay suites! Prepare meals in the in-room kitchenette with a microwave, fridge, cook-top, and sink. Relax in this contemporary suite with a dedicated workspace, high-speed Wi-Fi, and contemporary details. Set up your home base in our oversized suites, complete with a mini-fridge, microwave, and wet bar area. Sleep soundly on a king bed and pull-out sofa bed with premium linens. Each of our hotel suites in Kansas City, Missouri has a separate living area for guests to relax and unwind. 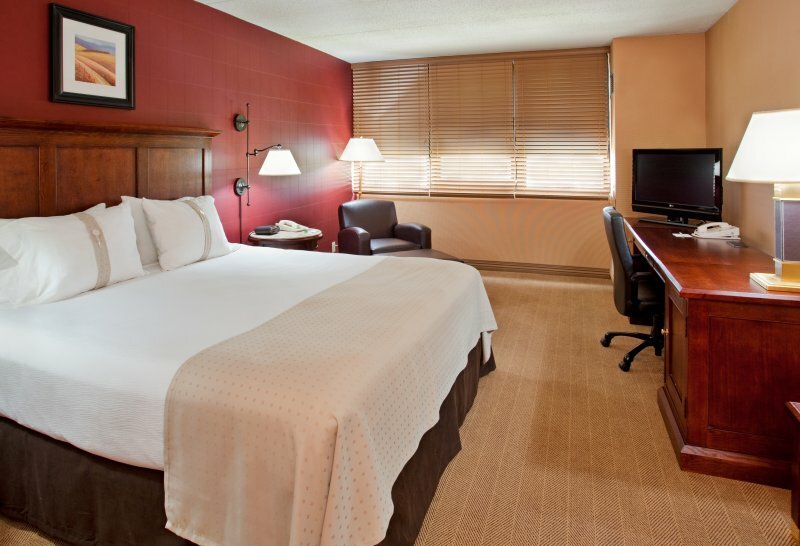 Call 816-737-0200 to book or submit a request through our Room Inquiry Form!